There is a lot to be said for automation in the business world, and cybersecurity is no different. However, there are times when only human intuition and intelligence will do. As cyber-criminals get better and faster, the requirement for information security professionals and functions to keep up and stay one step ahead intensifies. Cyber-criminals use automation to launch attacks, and to have any chance of defending against them, automation is necessary. 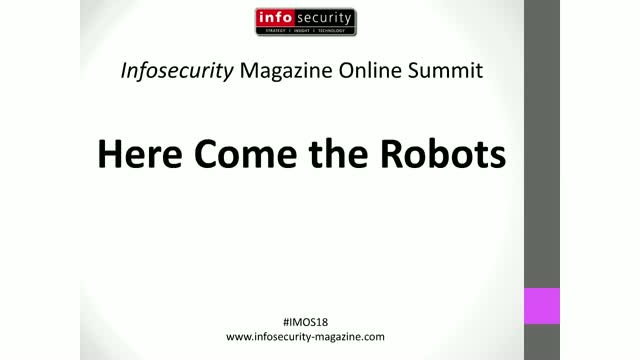 This session explores when it’s appropriate to automate and when robots just won’t cut the mustard. •What have we learned from the first year of GDPR, and what has changed? •Are businesses still failing to comply with GDPR, and if so, why? •What does GDPR look like for the UK following Brexit? The Domain Name System (DNS) plays a critical role in modern network connectivity. Unfortunately, it is also a central part of many cyber-attacks as DNS is involved in more than 90% of malware/ransomware and nearly half of all data exfiltration incidents. So how exactly how do cybercriminals use DNS to carry out attacks? In this webinar we will examine the many ways cybercriminals exploit the unique properties of DNS. Is cloud security your top priority, or it is languishing somewhere on a never-ending to do list? A user-driven cloud revolution has left IT and security professionals struggling to establish visibility of data and services, and unable to regain control of the risks associated with dispersed data and multiple cloud identities. So how should organizations regain control and begin putting the “frogs back into the box” for multi-cloud security? In this webinar, we will look at how to get ahead with cloud, build a ‘cloud culture’ into your business, underpinned by a platform approach to avoid further complicating the picture to get the most from the cloud, whilst also managing the challenges of data everywhere, multiple cloud identities, mobile connections and global compliance. What are the common pitfalls for multi-cloud security and how to avoid them? Modern-day cybersecurity threats require close monitoring and effective response. However, as data expands from on-premises to the cloud – or somewhere in between – new blind spots are emerging. With every purchase comes new technology, and that has to be patched, reconfigured and monitored for its lifetime of use. With the advent of IaaS and cloud services, questions arise about how long an organization should continue to use legacy systems, how to get the most out of them and, more importantly, how to ensure they are kept secure. A part of an organization’s security awareness training is the capability to run phishing tests on its staff. However, questions can frequently arise about how this should be done, with what regularity and the possible ethical issue of what should be done with those who ‘fail’ the test. The importance of knowing who is on your network, and verifying and authenticating who your users are, has become the cornerstone of information security in the enterprise in recent years. Ensuring the right individuals have the correct level of access to business resources is of paramount importance to a company’s data security strategy, and it is not without its challenges. CyberSN founder and CEO Deidre Diamond will look at the challenges around hiring and retaining your staff, and how you can create a career development plan to ensure that staff will want to keep working for you. She will also look at tactics to ensure people remain loyal, and how training and succession planning can help your team overall. In a candid and personal interview, Infosecurity will talk to Jennifer about her experience in the industry, the challenges facing the industry and more. Ransomware attacks are on the decline. Despite the devastation caused by recent ransomware outbreaks, a lack of public understanding about how to use cryptocurrency means that a lot of victims don’t know how to pay a ransom, whilst others are simply refusing to in greater numbers. As a result, cyber-criminals are struggling to get a monetary return for their time and efforts spent on ransomware, and so are turning to other attacks methods, such as banking trojans, to make their money. State-sponsored interference in recent political elections has given rise to widespread fears that election infrastructures are at significate risk from attackers who seek to target and influence voting data. This session will assess what the real threats are and their possible impact, along with discussing what needs to be done to ensure the safety of voting processes across the globe. In this special ‘How To’ session, an incident response expert will share advice on how best to prepare, rehearse and practice an incident response strategy. They will also give advice on the best ways to ensure your response plan works for you and your business. Recent years have seen the increasing convergence of cyber and physical security in organizations, with modern networks now designed to incorporate physical devices such as CCTV, card access readers and heating, ventilation and air conditioning systems. This has brought about significant business benefits, saving time and money. However, it has also led to new security risks and challenges for the enterprise. Dedicated to serving the information security community, in person, in print and online.